AndyPierce: Can't be 30 points. If you remove the split stones from the board it would like two free moves for white. Generally in the opening, a free move (handicap stone) is worth 10 points so these two stones would be a maximum of 20 points value. These stones are arguably overconcentrated so the minimum value would be 10 points, if the second stone adds no value. Since this enclosure is actually pretty good, the value is likely closer to 20 than 10, say 17 or 18 points. 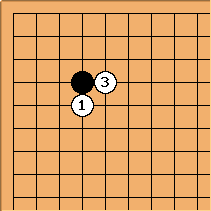 Reduce this by the aji left by the split black stones to get a value more like 14 to 15 points for white. Still a lot though. Tom: In this argument, are you taking account of the value of white's position in the corner before the ko threat is made? Paul Clarke: I suspect that Charles meant 30 points by deiri counting, i.e. a 30 point difference between Black answering the ko threat and White pushing through. That sounds about right to me. aLegendWai: It is just my humble opinion. It appears it is a misleading proverb to me. Any move can be a ko threat if the opponent has to respond in order to prevent from loss/damage etc. Here the proverb seem suggesting that only life-and-death moves are ko threats (ie the moves which threaten to capture one's group). In fact, any damaging move can be used as a ko threat. There are ko threats in the opening, but their value cannot be accurately assessed. Clearer. Less Argument (at least to me). (Sebastian:) Can you give an example for such a situation, please? The following is just a weak player's little opinion. They may be wrong. I saw this in a pro game. There is a serious fight in the lower side. The upper side is still open. A ko fight is involved in the lower side. A pro layer played this ko threat out. was a ko threat took the ko in the lower side. is the follow-up move. Bill: This is a good example of what the proverb is talking about. Yes, this is a ko threat, and one that can occur in the opening. What the proverb is saying is that, as a rule, Black should not answer it in an early ko fight. And so it is not really a ko threat. This is one of those proverbs that is enigmatically or provocatively stated, and not meant to be taken literally. The main page should make that clear. Another example is also from a pro game. But it is a fast game. I remember what the game is. It is luo xihe(W-7p) vs nie weiping(B-9p) - 1998-1999 cctv game (cctv2). Note:Although the ko occurred in the middle game, you may learn some other forms of ko threats from the game anyway. 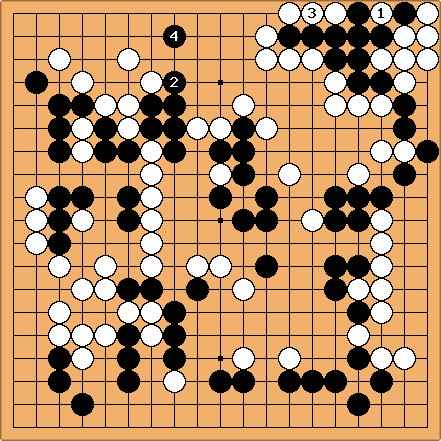 The pro played a ko threat which threatens to invade the opponent's framework. The opponent ignored it and took the ko. The commentary said the ko was worth about 30 points, but invasion of the opponent's framework was worth about 15 points only. B was losing. threatens to invade W's framework. is the follow-up move. There are a lot of potential ko threats in the opening. Bill: So what if their value is hard to assess? Your advice, aLegendWai, is tantamount to this: "If there is a ko in the opening, who knows whether to play a ko threat or not, or whether to answer one." That's hardly good advice. And, by the way, this is another example of trying to set yourself up as an authority. "Forget the proverb, follow my advice." I don't mean to harp on that, but it does put people off. aLegendWai: Sorry for the misunderstanding. Before the response, I've added It is my little opinion. already. I supposed this would not sound like an authority (but I was wrong, sorry!). In fact what I really wish to transmit is: It is just my ideas anyway. You may choose to follow or not. I'd just like to throw some support behind Bill's criticisms of ALegendWai's tone, so that it doesn't look like he's the only one irked by it. I find myself grinding my teeth at a lot of his statements, too. Please, please, please... learn some humility. Even when talking to weaker players, but especially when commenting on pages by stronger players. If the cheekiness is unintentional, here's a good rule of thumb to avoid treading on people's toes: phrase your ideas in the form of a question, rather than an assertion. That is, "Are you saying that the proverb means that there are ko threats in the opening, but their value cannot be assessed?" is much better than what is written above. It's not just about respect for others, either. Acting too sure of yourself makes you look foolish as well (I speak from experience here; earlier today, I cried "that's self-atari!" at the answer given on Beginner Exercise 49/Solution for instance, without looking carefully enough at the diagram, though that comment has been removed now). Remember, an insightful question makes you look just as good as a correct assertion. Meanwhile, there are no stupid questions, but an incorrect assertion makes you look bad. (this comment, and Bill's should probably be moved to a discussion page if they're going to turn into a conversation about Wiki etiquette). Now, a response to the actual idea expressed by ALegendWai, rather than just the way in which he phrased it: I disagree entirely. Or rather, while it's true that it's harder to judge the value of a ko threat in the opening than that of an atari on a group of stones in yose, to say that that's the meaning behind the proverb misses the point entirely. 2) Meanwhile, the sorts of ko threats that exist in the opening tend to be worth less than the ko threats that exist later in the game. The reason for that is that stones, in the fuseki, tend to be more spread out. A ko threat like the one given as an example on this page, although it renders the victim's stones almost useless when followed through, still only affects two stones. Endgame ko threats often threaten to cut off huge chains of stones, kill entire groups, etc. Proverbs are *never* iron-fast rules. They are general guides, and there are always exceptions. Modifying them until they lose their meaning, purpose, and most importantly aid to go players is not terribly helpful. Bill: This saying is already an interpretation, a free translation of the original, which is more like, An early ko is no ko. Maybe the translator felt that a straightforward translation was too cryptic. In the Ko Dictionary, Murashima Yoshinori explains the proverb as Alex does. With the kind of ko that typically arises in the opening, it is fine to ignore almost any ko threat. (Sebastian:) Would it make sense to say that the game was in chuban in the SW corner, but in fuseki in the SE corner? Bill: This seems to me to be an excellent example of both the proverb and an exception. The first threat is local, and so is not ignored, while the second threat is not local, and is. (Sebastian:) So if Black had played q instead of 29, would White have responded? Bill: You got me, Sebastian. ;-) I don't think that the threat of q is big enough, even though it is local, in a sense. The important White stones here are the ones on the sixth line, not the ones on the edge. The first threat threatens to save them, and weaken Black's stones in the corner. q has nothing to do with them, only threatening to cut one stone off from the main group. Let me put it this way. 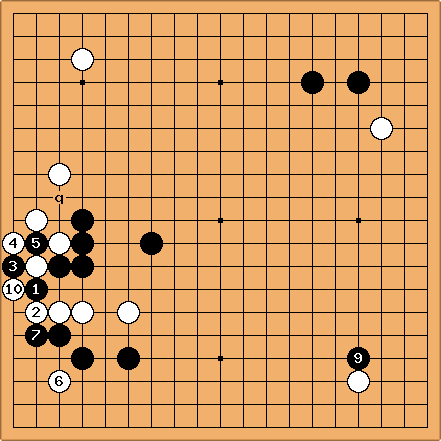 The ko is about strengthening White's stones on the 6th line. White's threat on the 3-3 offers another way to do that. If White can connect to it, the ko is moot. That is typical of local ko threats, to make the ko moot. q does not do that. I would not think of calling it a local threat, even though it is in the vicinity of the ko. If Black had played at , that would have been a local threat, and White would have answered it. (Sebastian:) Thanks for using the example, even though it's too small, for a great explanation of the concept. Bob Myers: ((I've edited my comments here and below based on John f's definitive input.)) In Japanese, the proverb in question is "sho-kou ni kou nashi (初コウにコウなし)". One rather loose way of translating this, focusing less on the lack of ko threats in the early game and more on its consequences, could be "Don't pick a ko fight too early in the game." Bill: Well, Bob, that advice is too broad. Taking a ko is often a good idea in the opening, and that is usually considered starting a ko fight. As Murashima explains, the proverb is really about not answering ko threats in an early ko fight. Bob Myers: Taking a ko in the opening is often *not* starting a ko fight, and in any case, I was using "starting a ko" in a different sense of "picking a fight", in other words "taking a line which will lead to a ko, in which your opponent takes first" (roughly, Japanese shikakeru). rubilia: Bob, I am quite overwhelmed by your suggested wording. It nicely shows to me how naturally Japanese proverbs can be understood in a way that keeps the content straightly right, instead of committing verbal overplays (which can turn people off proverbs completely, in deed - I go along with aLW there). Particularly, the "too early" sounds elegant to me, since that makes clear it's up to the player to examine if something is "too" early or not. Essentially, your sentence is a reminder on the tendency that big enough ko threats are rare in the early stages of games, but not attempting to give explicit advice, which couldn't be done by a 5 to 10 words phrase appropriately, anyway. Bill: The professional explanations of this proverb I have seen are as given by Murashima in the Ko Dictionary (and by Alex Weldon). In Ko Technique, Lin explains the proverb succinctly: For a ko that occurs very early in the opening there are no ko threats. The editors of Igo, in The Stickiness of Ko, say that for an early ko there are no real ko threats (kodate rashii kodate). As for the question of starting a ko fight early in the game, it is very important who takes the ko first, all else being equal. Still, early kos do arise. That subject is both more general and more difficult than the point of the proverb. John F. Kou in Japanese also means koudate (e.g. as in sonkou or zettai kou). Hayashi lists both meanings. In the phrase shokou ni kou nashi it appears in both its meanings: There are no ko threats for an early ko fight. The great Hayashi also adds that shokou sounds a bit odd in Japanese so that many people prefer to rephrase it as shogo. It's worth bearing in mind what the kou character really means - nothing to do with aeons, it means a threat. The usage of kou as a ko-fight is the one that is derivative. Bob Myers: That's fascinating--that "kou" means threat. So a ko fight is really a battle to see whose threats are better? As long as we're on the subject of terminology, can you elucidate on the meaning of "kou-date" (or its verbal form "kou wo tateru") meaning a ko threat? Is the implication that I "put up" one of my threats to see how it does against one of my opponents? (Sebastian:) Indeed! In Chinese, it meant "to rob". The 说文解字 says: 人欲取，以力止，曰劫。 从去， 从力， 会意。(Sometimes even written with "刀" instead of "力"!) How come this character of all characters was taken to represent a sacred Sanscrit term? John F. Bob, I've never seen anything unusual in the usage of tateru to mean things like establish, set up, initiate, install etc, so I'm a little puzzled by the question. 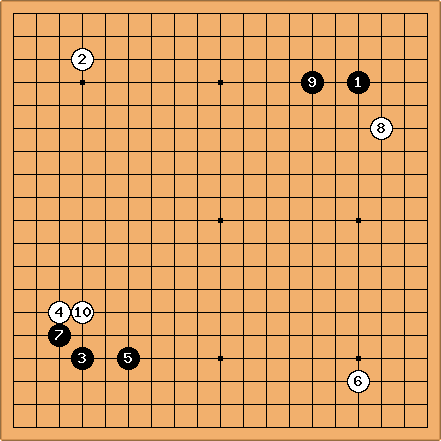 But there is a similar usage in go for ishidate, the old word for fuseki. The answer to Sebastian's question is easy. Jie is an abbreviation of jiebo, 劫波 which was an ancient transliteration of Sanskrit kalpa. The reference to Chinese suggests it is worth pointing out that ancient Chinese texts make a point of distinguishing between a threat (jie2) and a recapture in a ko fight (yi4) 毅. Koudate does not have a Chinese meaning.